(ANNOUNCER)>> THEY'RE FAST, TOUGH, AND INCLUDE STATE OF THE ART MOTORS AND SUSPENSION, BUT THE BEST PART IS YOU DON'T HAVE TO MORTGAGE YOUR HOUSE TO OWN ONE. 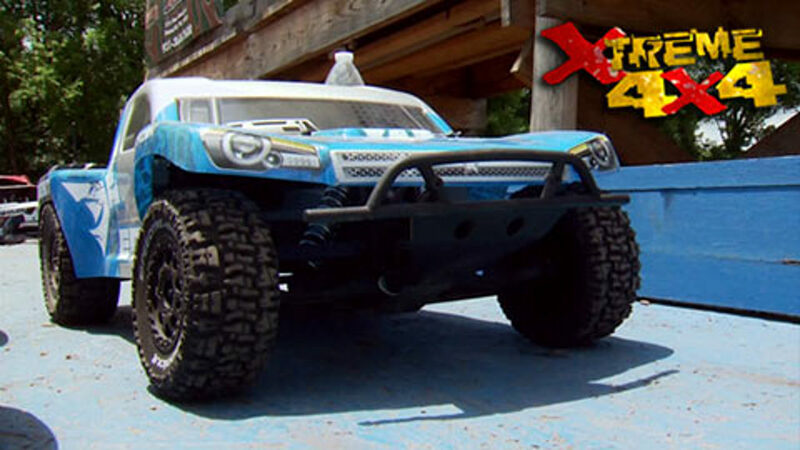 TODAY ON XTREME 4X4 WE TAKE A LOOK AT SOME OF THE COOLEST R/C TRUCKS AROUND, FROM BACK YARD BUGGIES TO HIGH END COMPETITIVE RACERS. PLUS FULL SCALE ACTION FROM THIS YEAR'S MOAB DIRTY RIOT RACE. COOL FOR YOU GUYS. I'VE BEEN ABLE TO GET MY HANDS ON SOME ACTUAL SHORT COURSE RACE TRUCK. TAKE THEM OUT, SLING SOME DIRT AROUND, AND THEN BRING THEM IN THE SHOP AND SHOW YOU HOW YOU CAN TUNE THEM FOR BETTER PERFORMANCE AT THE TRACK. I'VE GOT MY RACE HELMET AND MY RACE SUIT, I'M HEADING TO THE DIRT. NOW I'M SURE ALL OF YOU HAVE FIGURED OUT BY NOW THAT WE ARE NOT TALKING ABOUT ACTUAL SHORT COURSE RACE TRUCKS. 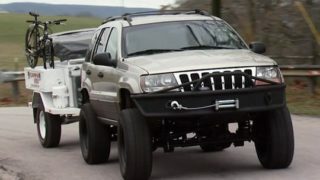 NOW OFF ROADERS ARE A NICE GROUP OF PEOPLE, BUT I DON'T THINK THEY'RE JUST GONNA HAND US THE KEYS TO THEIR HALF MILLION DOLLAR RACE CAR TO HAVE A LITTLE BIT OF FUN WITH. INSTEAD TODAY WE'RE TALKING ABOUT THE COMPETITIVE WORLD OF ONE TENTH SCALE REMOTE CONTROL SHORT COURSE RACE TRUCKS. AND THIS IS A GREAT WAY TO JUST GET OUT AND HAVE A LITTLE BIT OF FUN IN THE DIRT OR MAYBE GET YOUR KIDS INTERESTED IN COMPETITIVE OFF ROAD RACING. NOW THE BAR TO GET INTO THIS SPORT IS ACTUALLY FAIRLY LOW. YOU CAN PICK UP ONE OF THESE LOWC TORMENTS FOR UNDER $200 DOLLARS AND UPGRADE IT AS YOU GO. OR YOU CAN JUMP IN FEET FIRST AND FOR JUST UNDER $1,000 STEP INTO ONE OF THESE 22 SCT'S AND HAVE A RACE READY TRUCK RIGHT OUT OF THE BOX. NOW THERE ARE DIFFERENT CLASSES DEPENDING ON THE MOTORS AND THE TRUCKS, AND THE TRUCKS FIRST BREAK DOWN INTO THE NUMBER OF DRIVE WHEELS. 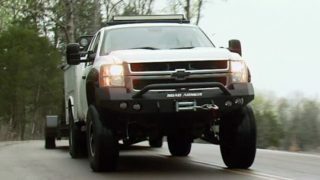 THERE'S A FOUR WHEEL DRIVE SHORT COURSE TRUCK, WHICH IS SET UP VERY SIMILAR TO A FULL SIZE TRUCK. 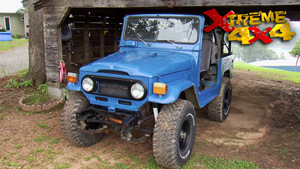 IT'S GOT AN ENGINE THAT DRIVES A BASICALLY SMALL TRANSFER CASE, TWO DRIVESHAFTS THAT CARRY POWER DOWN AT DIFFERENTIAL TO DRIVE ALL FOUR WHEELS. AND THEN THERE'S A TWO WHEEL DRIVE RACE TRUCK, WHICH IS SETUP VERY SIMILAR TO A STANDARD REMOTE CONTROL CAR WITH THE MOTOR AT THE BACK, BEHIND THE REAR AXLE, WITH THE DIFFERENTIAL SET UP BACK HERE. NOW EVEN THOUGH THEY SHARE A LOT OF SIMILARITIES TO THE FULL SIZE TRUCKS WITH ADJUSTABLE COIL OVER SUSPENSION AND ADJUSTABLE PICK UP POINTS FOR ALL THE SUSPENSION ARMS, THE REAL DIFFERENCE IN THESE TRUCKS IS ACTUALLY IN THE ELECTRIC MOTORS. ENTRY LEVEL R/C TRUCKS ARE OFTEN EQUIPPED WITH A VERY SIMPLE ELECTRIC MOTOR. IT'S REFERRED TO AS A BRUSHED ELECTRIC MOTOR, AND THEY'RE NOT TOO BAD FOR JUST MESSING AROUND AT THE HOUSE. ENERGIZE THE ELECTROMAGNETS INSIDE THE MOTOR BY RIDING ON THE COMMUTATOR RING. INSIDE THE MOTOR YOU HAVE TWO FIXED MAGNETS ON THE OUTSIDE AND A SERIES OF WINDINGS THAT CREATE THE ELECTROMAGNETS. WHEN YOU ENERGIZE THESE MAGNETS, THE OPPOSING POLES CAUSE THE MOTOR TO SPIN. ON A BRUSHLESS MOTOR IT'S THE EXACT OPPOSITE. YOU HAVE THE FIXED MAGNETS MOUNTED TO THE SHAFT OF THE MOTOR, AND THE ELECTROMAGNETS ARE SPREAD AROUND THAT SHAFT. BRUSHED MOTOR AND STEP UP TO THE BRUSHES. TO INSTALL THE NEW BRUSHLESS MOTOR THE COVER IS REMOVED AND THE OLD MOTOR TAKEN OUT. THE PINION IS THEN SWAPPED AND THE NEW MOTOR IS ALIGNED WITH THE RING GEAR. THE NEW ELECTRIC SPEED CONTROL REPLACES THE OLD UNIT AND IS EQUIPPED WITH A FAN TO PREVENT POSSIBLE OVERHEATING WHILE RACING. A SHORT COURSE PRO. PLUS FULL THROTTLE RACING FROM THE DIRT RIOT SERIES. WILL ALLOW US TO FINE TUNE THE SUSPENSION WHEN WE'RE AT THE TRACK. THE REAR DIFF IS TORN DOWN AND AN ALL METAL GEAR SET IS INSTALLED ALONG WITH HEAVY DUTY AXLE SHAFTS. UPGRADING THE STEERING SERVO WILL HELP GIVE US MORE POWER TO TURN THE WHEELS WHEN WE'RE TRAVELLING AT HIGH SPEEDS. ON IT ARE A LITTLE BIT MORE REFINED. 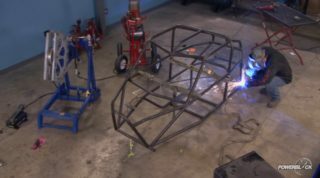 WE'RE GONNA BE STIFFENING UP SOME KEY COMPONENTS OF THE CHASSIS, AND LIGHTENING CERTAIN ITEMS AS WELL AS MAKING THEM STRONGER. BUT YOU'D BE SURPRISED AT THE AMOUNT OF CHANGE THAT'S GOING TO HAPPEN TO THIS TRUCK WITH JUST THESE SMALL HOP UPS. FULL SIZE TRUCK BY CHANGING THE SPRING RATE ON THE COIL OVER. NOW ONCE I GET THE SAME UPGRADES DONE TO THE FRONT SUSPENSION WE'LL BOLT EVERYTHING DOWN TO THIS TEAM LOSI RACING FLEX TUNED AND LIGHT CHASSIS. NOW IT'S JUST BEEN MACHINED OUT IN KEY AREAS TO MAKE IT A LOT LIGHTER. AND ONCE EVERYTHING IS BOLTED IN PLACE, THE TRUCK WILL ACTUALLY BE A LITTLE BIT STIFFER, MAKING IT MORE PREDICTABLE WHEN WE'RE AT THE TRACK. SOME DADS TAKE THEIR SUN FISHING ON THE WEEKEND, BUT THIS FATHER AND SUN TEAM PREFER SOMETHING A LITTLE MORE INTENSE. RIOT SERIES WILL GIVE YOU A PLACE TO RACE. THE COURSE WAS A LAP STYLE EVENT WITH OPTIONAL LINES FOR DIFFERENT RIGS. ONE SECTION ALLOWED THE ULTRA FOUR CARS TO SAVE SOME TIME BY AIRING IT OUT AND AVOID A STEEP HILL CLIMB. BUT TIME IT WRONG AND YOUR DAY COULD BE OVER. OFF ROAD RACERS ARE A CLOSE KNIT GROUP BUT IT DOESN'T GET ANY CLOSER THAN BRIAN AND LEVI SHIRLEY, THE FATHER/SON DUO OF LUCKY DOG RACING. (BRIAN)>> OUR TEAM IS MADE UP OF MY SON AND I, FAMILY, CLOSE FRIENDS. LEVI SHIRLEY'S MY SON. WE BOTH RACE, WE BOTH HAVE IDENTICAL CARS. WE HAUL IN THE SAME RIG, WE HAVE LIMITED QUARTERS IN THE TRAILER, WE HAVE A GOOD TIME. A TEST OF ENDURANCE. TO SUCCEED YOU MUST BE PREPARED AND HAVE A GOOD ATTITUDE, WIN OR LOSE. VALUES HE PASSES ON TO LEVI. WOULD TIE FOR SECOND. HIS FATHER WOULD FINISH MUCH FURTHER BACK IN THE PACK. NOW LAST YEAR LEVI WON IT ALL BUT BY THE END OF THIS SEASON THE TITLE OF NATIONAL CHAMPION WOULD PASS FROM SON TO FATHER. (ANNOUNCER)>> WE'LL BE READY TO RACE AFTER A TUNING SESSION WITH THIS SHORT COURSE PRO. 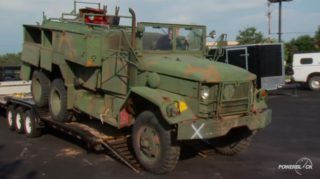 (IAN)>> WITH ALL OF THE HOP UPS COMPLETE ON OUR SHORT COURSE TRUCK, WE LOADED THEM UP AND HEADED DOWN TO OUR LOCAL R/C TRACK. NOW WE ARE BY NO MEANS AN EXPERT IN DRIVING THESE RIGS. SO WE CALLED IN A GUY WHO KNOWS ABOUT THE EXCITING WORLD OF SHORT COURSE R/C RACE CARS. (RICHARD)>> THEY'RE UNRULY, THEY'RE JUST LIKE THE FULL SIZE TRUCKS. YOU'VE GOT TO ACTUALLY DRIVE THE THINGS. SOMETIMES SLOWER ACTUALLY FASTER. JUST KEEPING IT PINNED ALL THE TIME, THAT'S JUST TWICE THE RISK THAT YOU'RE GONNA HAVE FAILURE. (IAN)>> AND LIKE THEIR REAL LIFE COUNTER PARTS, THERE'S A LOT OF THINGS TO TUNE IF YOU WANT TO GET PEAK PERFORMANCE OF YOUR REMOTE CONTROL RIG. (IAN)>> ONE OF THE EASIEST AND MOST AFFORDABLE TWEAKS IS TO CHANGE THE FOAM INSERT INSIDE THE TIRE. TACKY, YOU KNOW, NO DUST TRACK. BUT THE LOOSER IT GETS, YOU MIGHT STIFFEN UP A LITTLE BIT. 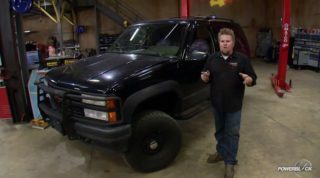 (IAN)>> THE TIRES YOU RUN PERHAPS HAVE THE BIGGEST SINGLE EFFECT ON YOUR TRUCK'S HANDLING. YOU'RE GONNA WANT TO HAVE FOUR OR FIVE FULL SETS IN VARIOUS COMPOUNDS TO BE READY FOR WHATEVER THE TRACK CONDITIONS ARE. RICHARD PULLED IN A COUPLE OF LAPS WITH A STOCK TORMENT JUST TO SEE HOW THE BASE MODEL PERFORMED. I JUST WANT YOU OPINION, PROFESSIONAL OPINION ON YOU KNOW. 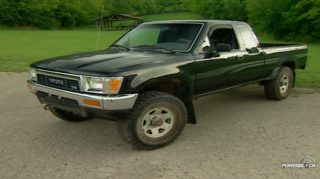 FOR A $150 DOLLAR TRUCK, DRIVE IT IN, AND THEN WE'LL DO A COUPLE OF LAPS IN THE HOPPED UP VERSION. IS IT REALLY WORTH DOING ALL THAT WORK. (RICHARD)>> SO FAR IT FEELS GREAT FOR OUT OF THE BOX, LOW COST ENTRY LEVEL MACHINING SEEMS TO BE HANDLE THE DUST, SURFACE REAL GOOD. JUST BE IN STOCK. IT'S FAST ENOUGH TO KEEP THE NEW DRIVER INTERESTED BUT IT'S NOT SO FAST TO WHERE HE'S ON SUCH A STEEP LEARNING COVER. 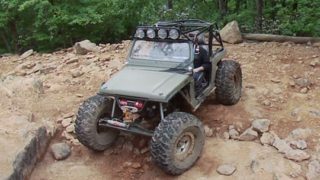 (IAN)>> THEN WE GAVE HIM OUR HOPPED UP ONE, WHICH INCLUDED A BRUSHLESS MOTOR UPGRADE, NEW SHOCKS, AND AN ALL STEEL DIFFERENTIAL. RIGHT AWAY, DO YOU NOTICE A DIFFERENCE IN IT? 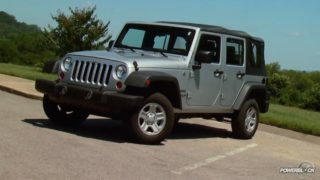 (RICHARD)>> IT'S GOT A LOT MORE TORQUE, AS FAR AS IN THE TURNS. INSTEAD OF BOUNCING AROUND. IT'S NOT JUST GIVING WAY AND THEN REBOUNDING OFF OF IT, GIVING YOU FUNNY FLIGHT. 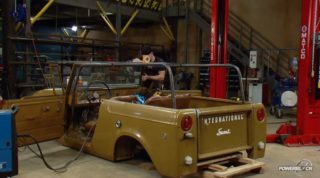 (IAN)>> THE UPGRADES DEFINITELY TOOK OUR TRUCK TO THE NEXT LEVEL WITHOUT SPENDING TOO MUCH MONEY. BEFORE HE LEFT, RICHARD GAVE US ONE FINAL PIECE OF ADVICE. (RICHARD)>> IT'S JUST LIKE ANYTHING PRACTICE MAKES PERFECT. THE MORE AND MORE YOU DO IT, THE BETTER AND BETTER YOU'RE GOING TO GET.